New York Rangers President and General Manager Glen Sather announced today that the club has agreed to terms with free agent defenseman Blake Parlett. 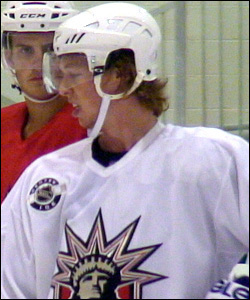 Parlett, 22, skated in 24 games with the Connecticut Whale of the American Hockey League (AHL) this season, registering two goals and 10 assists for 12 points, along with 17 penalty minutes. He made his AHL debut on February 18 at Adirondack, and tallied his first AHL point with the overtime, game-winning goal, in a 2-1 victory at Springfield on March 5. Parlett tied for third among team defensemen in assists and points, despite playing in only 24 games. He also tied for fourth among AHL rookie defensemen with two game-winning goals. Parlett notched a goal in his AHL playoff debut at Portland on April 14, in Game One of their Atlantic Division Semifinal matchup. He finished the postseason ranked second among Whale defensemen in assists (two) and points (three), and tied for third on the team in assists and fifth in points. Defenseman Blake Parlett attended the Blueshirts' annual Prospect Development Camp last summer and will be returning to the MSG Training Center as part of the team's main training camp in the fall. The 6-1, 205-pounder began the 2010-11 season with the Greenville Road Warriors of the ECHL, registering seven goals and 25 assists for 32 points, along with 40 penalty minutes in 46 games. He led all ECHL defensemen in points, and was tied for the league lead among blueliners in assists at the time of his recall to Connecticut (AHL) on February 17. Parlett was assessed a fighting major while making his professional debut with Greenville on October 21 vs. Florida, and recorded his first career points with two assists on October 22 vs. Florida. He was named an ECHL All-Star, posting a plus-four rating in the game on January 26. Parlett tallied eight points (one goal, seven assists) in his final five games with Greenville from February 5 to February 15, prior to his recall to Connecticut (AHL). He also recorded one assist in two playoff contests with the Road Warriors. Prior to turning professional, the Bracebridge, Ontario native skated in 301 career games with Barrie, Windsor and Mississauga of the Ontario Hockey League (OHL), registering 28 goals and 88 assists for 116 points, along with 361 penalty minutes. He established OHL career-highs in goals (11), assists (35), points (46), and penalty minutes (108) with Mississauga in 2009-10. Parlett led Mississauga defensemen in points, goals and assists, and ranked second on the team overall in assists and fourth in points that season. In addition, Parlett registered nine points (one goal, eight assists) and 45 penalty minutes in 44 career OHL playoff contests with Barrie and Mississauga.